Welcome to The Commando Headquarters, the first webpage dedicated to Capcom's timeless shooter classic, Commando. Many overhead-view shooter games have been released in the many years of video gaming (some notable ones being Ikari Warriors, Mercs, Gunsmoke, and many others). For me, Commando is the mother of all these type of games and even to this day, despite its aging graphics and sound, Commando still holds a respected place in this specific video game genre. Often imitated, but never truly reproduced, Commando offers straightforward, challenging game play, while keeping the player involved with appropriate military-type music and battlefield settings that really make you feel like you are in the battlefield with The Commando. Without a doubt, Commando has attained that status of "classic" which is the domain of only a few games. I hope my humble website will provide all the information, tools, and files necessary for the full enjoyment of this great game. Let the shooting begin! This site best viewed at 800x600 resolution. 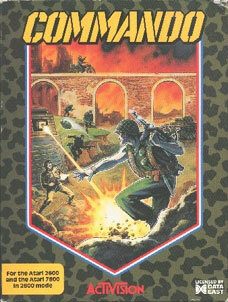 Commando is the respective trademark of Capcom. All the graphics on the webpage are the creation of Firebrand (webmaster) and may be used only with permission from the author. Files on the Multimedia Page were collected from various free and publicly available websites and free donations by individuals. None of the content has been taken from fee-based websites. The Commando marquees, cabinet, and flyer pictures are computer image reproductions of actual marketing and decorative images, owned by Capcom.